When you are face the enormity of nature, in its exquisite beauty, there’s nothing that you can do but stand dumbstruck and gape in wonder. You do that when you are at the Niagara Falls. There couldn’t have been a better way to celebrate my 47th birthday – first in Canada – than at the Niagara Falls. The journey was impromptu – as most things are in my family. We decided to take the Via Train because Che was keen to go by train. Unfortunately, it turned out to be an Amtrack train and Che was distinctly displeased because it, as he said, looked like Mumbai’s local trains from outside. The journey wasn’t too long – just a little over an hour-and-a-half. Then a quick taxi ride and we were at the falls. I had expected many people. Any tourist place in India would have at least a few hundred thousand tourists from both across India and across the world. At Niagara, there weren’t. Half the shops at the shopping mall near the falls were closed. The reason: It was bitterly cold even though March 20 was the first official day of spring. The first impression I got of Niagara at the railroad station was that I was in a small town in Uttar Pradesh. Mahrukh felt the station resembled Lucknow railway station; except that there weren’t any people present. Lucknow's railway station is grand. Niagara's railroad station, I felt, resembled Bahedi, a small town on the foothills of Nainital that I visited twice in the early 1980s when I was trying to fulfill my father’s unfulfilled ambition of becoming a chartered accountant. Thankfully, after a few years I gave up trying to do something I didn’t want to, and to his credit, Meghnad supported me wholeheartedly as I became a journalist. I’m sure Bahedi must be a much bigger and bustling town today. But in the early 1980s it was a sleepy one-train town that probably grew near a sugar factory. Sorry for that digression. I'm getting old and I reminiscence more than I should. 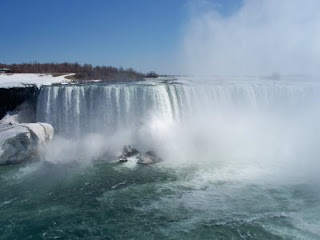 The falls are the force and fury of nature in all its untamed violence. We had seen nothing like this before. The closest that I can think of are the the Dhaundhar falls on the Narmada. Mahrukh quickly pointed out that I was merely being India-obsessed and not real. She’s right. Niagara is incomparably amazing. You’ve seen the video along with this blog entry. Even in an amateur video the magnificence of the fall is all too evident. 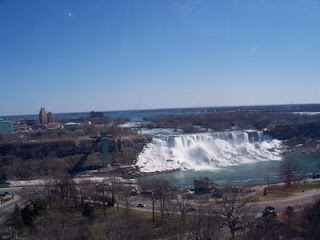 Then we sat in a 50-meter high Ferris wheel, which got Mahrukh all excited and then we went a few miles out of Niagara Falls into the US territory – not crossing the border – but the cell phone service switched over to the US and reached the butterfly conservatory. I’ve already put some of the photographs on the blog (the right panel). This was an unexpectedly wonderous experience. Tropical butterflies from across the world in a climate-controlled transparent dome - a sort of a hothouse. Our barometer of whether a place is good or not is how Che reacts to the place; and after initial diffidence, he got involved and loved every moment we were there. A cab driver – from Newfoundland – took us to the conservatory and brought us back to the railroad station. He found my fascination for our apartment at the intersection of two of Toronto’s busiest streets – Keele and Lawrence Avenue West – quite odd. That's not surprising. Most Canadians prefer quieter areas to live. We spoke about the Sikorsky helicopter tragedy last week that killed 18 Newfoundlanders. The return journey was also by Amtrack. We’re already planning a trip to Montreal. Che says Amtrack can’t be going there! He’s keen we do the Toronto-Vancouver trip. Maybe in a couple of years.